The sink hole had been used as a local dumping ground for years, and some even say a place where the occasional mafia victim met an untimely end. However, Senor Modesto convinced the fire brigade, the local university and the army to help removed three truck loads of waste, including a car. 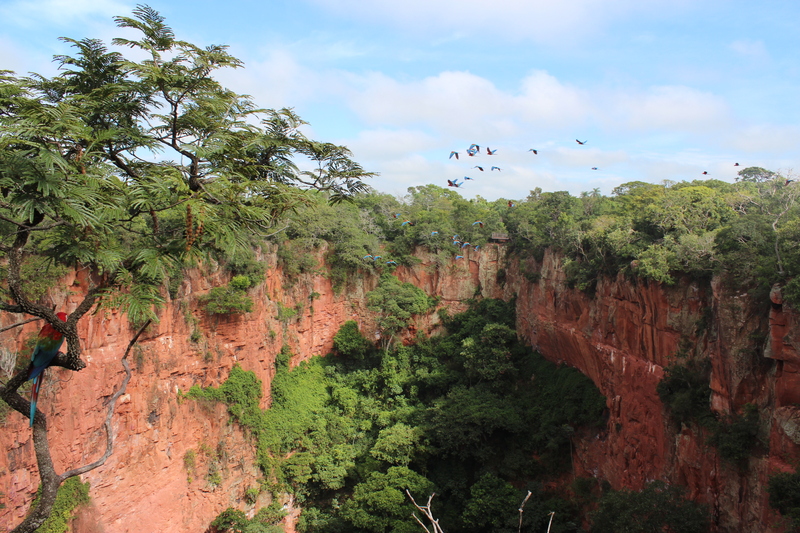 Soon after, Modesto was able to re-introduce the wild red winged macaws to the area, that give the hole it’s name – Buraco das Araras – hole of the Macaws. Now, more than 20 mating couples of Macaws live and breed in the holes walls and surrounding trees. He and his sons have mostly stopped farming and are able to rely entirely on the income that the sustainably managed tourists bring in. And if you are looking for somewhere to stay, I can recommend the Hotel Wetiga. It’s a four star hotel 1km from the centre of town. You might think it’s a bit strange, but even after a day in the water snorkeling or scuba diving, I still made a little time to sit in Wetiga’s spa. I particularly liked the indigenous pottery displayed in the lobby, with the stories of its symbolism and heritage. Just ask the lovely Emily for more information. Back in central Bonito, I met Juca, and his marketing director, Aleksandra Skoszkiewicz for dinner at Casa do Joao. I had a few lovely strips of fried caiman, and we shared a huge deep fried fish. It’s a slightly different take on our UK national fish and chips dish! As Juca told me over dinner, only about 40% of the natural attractions he has discovered in the Bonito area have been turned into tours. 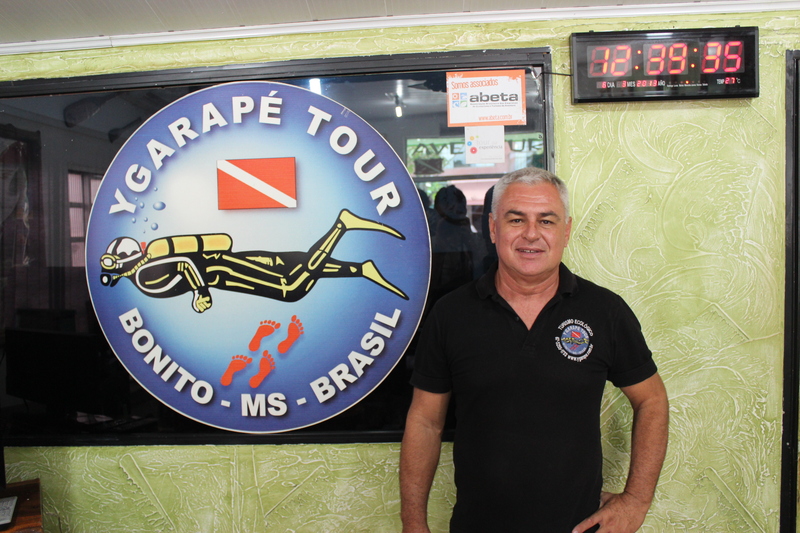 Juca estimates there are already about 40 existing tours in Bonito (and nearly as many tour agencies). Just from Juca’s own explorations, he knows of at least another 60 opportunities here for sustainable tourism. Bonito is seeing huge local growth, fuelled by this potential for eco-tourism. The local government and tour agencies will have to continue to be as proactive and careful with their precious natural resources as the demand for tourism increases. Unscrupulous, opportunistic, short term thinking operators will try to move in. I am sure that responsible operators like Ygarape will lead by example, and continue to keep Bonito beautiful. Eco-Bonito – The most fun you can have in a wetsuit. This entry was posted in Brazil, Central Region, Eco Tourism and tagged bonito, brazil, Central Region, ecotourism, social entrepreneur, travel, Travel and Tourism, ygarape. Bookmark the permalink.